Way back in December 2012, during the last Israeli aggression, my posts were much shorter, I wonder why. And I allowed myself a little reflection, in post 3, on whether the recent ceasefire meant peace. What it is to have acquired a history as a chronicler. This particular war has been particularly mean and vindictive, with its repeated ‘truces’, with the constant claims that schools, hospitals and tomato purée factories are legitimate targets. (See Hague Regulations article 23 (g) and Fourth Geneva Convention article 147 for destruction of property ‘not justified by military necessity and carried out unlawfully and wantonly’, for example. Grave breach, so a war crime.) And the mountain of dead civilians, men, women and children. But then, according to some commentators, there are no ‘innocent civilians’ in Gaza – they are guilty of having elected a Hamas government, and seem to be supporting it even now. This doctrine seems hard to square with the above conventions. In an attempt to address the situation, Richard Falk and Akbar Ganji have argued for Israel to be recognized (in a term borrowed from John Rawls) as an ‘Outlaw state’. But what would follow from that? There is no court which punishes outlaw states. at my own college, he found himself unemployable. (Except at McDonald’s, and he was getting varicose veins.) After six months on JSA, being offered various deadbeat schemes which were supposed to improve his prospects, he did what any self-respecting healthy young man would have done, went off and enlisted with the Islamic State. He doesn’t understand the attitude of his job advisor who, far from being pleased that he’d found himself an occupation, threatened to get him wiped out by a drone – as if that kind of decision is within the remit of the humble employees of the DWP. (I’ll call him ‘Bert’ to protect his identity.) He likes the travel, although the pay hasn’t been so good up to now, nor the food; but he welcomes the news that the IS is now planning the conquest of Rome, as he has always wanted to go there and likes pizza. Plus ça change; and in case you’re becoming too depressed, as I was, let me recommend that you read the opening chapter of Marc Bloch’s magisterial (have I used that word lately?) ‘Feudal Society’. This whisks us back to the year (roughly) 700 when Western Europe, at the time pretty uncivilized in any case, was constantly being overrun by a) Saracens, b) Hungarians and c) of course, Vikings. As Bloch points out – indeed ibn Khaldun had noted it long before – these hordes of human locusts soon, like Ulugh Beg of Samarkand, succumb to the decadent lure of the city and build mosques and observatories and stock exchanges. It’s just a matter of la longue durée. If you can survive in Aleppo or Rome for two hundred years, you’ll find life is pretty much like a Mozart opera, with Western prisoners singing the praises of humanitarian Islamic rulers. 1) this place is TERRIBLE! Please do not even think about going here for dinner it’s the worst food I’ve ever eaten. We were also the only table in there and after eating I know why. Drinks were standard but music was awful too, thoroughly ripped off! 2) This is definitely my favorite place. My favorite place for live music that I found. It’s a pretty small place and gets packed easily,so go early for sure.its a really cute atmosphere. The waitress are really attentive and on top of getting you drinks . Without the owner the place will not be the same. He is artist ;the decoration is out of this world . Being a artist myself I am inspired when I am in the Dalston Jazz bar. Rustic and raw . The food is homely and spiritual . Thank you Dalston jazz bar. 3) Very unfortunate to have experienced this place – one of the most disappointing and disastrous evenings out in years! If you ever see a deal on the likes of Living Social, Groupon, et al, leave well alone, even if it’s free. Tell me what you think. I also – like you? – waste hours on Twitter; I start with Donatella (@DRovera) who is always in the most dangerous bit of Iraq – to check she’s still alive. Same with various people in Gaza (@Mogaza, etc), you find out about bombings etc quicker than on aljazeera and in more detail. But then I get on to really idiotic feeds like AskIslamicState, with questions like ‘Do you happen to know when the DFS sofa sale is likely to end?’ or ‘What do you think about structuralism? Or are you more of a post-structuralist kind of person?’ Is reading this garbage how I was meant to spend my declining years, and me with a Kindle? (No, that’s a rhetorical question, not aimed at the Islamic State.) Rather than the dangers of Alzheimer’s Disease, I’m seriously afraid that I – and many others – will suffer rotting of the brain from daily exposure. Finally, for my friend and any others who may find themselves enlisting: here’s the classic ‘Johnny I hardly Knew Ye‘. It isn’t going to be over by Christmas. (how it’s changed since the days of Omar Khayyam, etc.) Such trivia we leave to the popular sheets like our confrère the Guardian. And we who spend our evenings watching Press TV and the films of Kiarostiami and Farhadi expect Iranian women to be sharp and feisty anyway. So here’s a quick exposition of the main lines of Mirzakhani’s groundbreaking paper from the 2007 Inventiones Mathematicae, insofar as I’ve grasped it from the usual lightning read-through. As you will realize if you’ve ever given it a try, finding Weil-Petersson volumes of moduli spaces is not exactly a breeze. Mirzakhani’s amazing find is this. Look at the moduli space of bordered hyperbolic Riemann surfaces of genus g with n geodesic boundary components of lengths Calling this then its Weil-Petersson volume (look it up, am I supposed to do all the work already?) is a polynomial in the L‘s. Pretty cool, eh? More precisely, where the coefficients lie in Yes, good old pi as in the area of a circle. I guess none of us were surprised by the exponent (those g‘s and n‘s had a familiar look); but pi was a surprise. I haven’t been keeping up with the literature, obviously. some pretty fancy pictures, such as we toilers in the fields of Riemann surfaces always appreciate. The more nerdy among you may also be impressed by my new-found ability to incorporate mathematical formulae in these communications (the magic word ‘plug-in’ is appropriate here). Even if I can’t get them to sit smoothly in the text rather than being ‘displayed’ – I’d appreciate some help on this. Which leads us naturally to the question of Palestine’s membership of the International Criminal Court. This is a bit confused. It seems that in order for the Israeli Government to be prosecuted for war crimes at the ICC, as is obviously sensible, the state of Palestine, or the Palestinian Authority, or whatever, needs to have acceded to the Rome Statute. This in itself is bizarre, since it allows freedom to commit war crimes on anyone’s territory if they have not acceded to the Statute. Well, I thought, there are likely plenty of war crimes in Somalia, and the chances that Somalia has ratified the statute are slim. Right on both counts. But as Somali Rights pointed out a while back, the Prosecutor has the power under Article 15 to instigate an investigation proprio motu into crimes within the Court’s jurisdiction, whatever that is – I refer you to Article 13, there’s plenty of time and money for lawyers to sort that out. In the Somali case, the complaint was about Kenya, who have ratified the statute and are independently embroiled with the ICC over the case of the ‘Ocampo six’. But I digress. It should be pointed out a) that the PA is in the process of making the application, see Hanan Ashrawi’s interview. and b) that in the larger picture, this all seems beside the point. As I learned a while back, war crimes are very illegal, being outlawed by the Hague and Geneva Conventions, which everyone has signed and which are guaranteed by that wonderful institution the Red Cross in Geneva. Not that the Red Cross will/can punish you for anything; but ratification of the conventions leads to the famous ‘universal jurisdiction’, i.e. the UK government has a duty to arrest a war criminal who lands at Heathrow – as nearly happened with General Almog. and there won’t be any thieves. Many of my younger readers (yes, I have them), have given me stick for not giving space to any of Amy Winehouse’s oeuvre – favouring these foreign artists over the home-grown North London product. Quite right – and so here is the immortal ‘Rehab‘. ‘There’s no final paragraph that neatly wraps up these sort of incidents, no happy ending. But there was a moment for me that stood in contrast, at the home of one of our wonderful reporters in Gaza, Adel Zaanoun. We sat down for the iftar evening meal and he insisted that I hold his two-month-old twins, Adam and Alma. Indeed, it’s always a bad idea to be simply depressed or angry about the occupation of Palestine. I recall that during a visit to Bethlehem, one of our party complained about the dreadful things we were being forced – in his case for the first time – to see (queues at checkpoints, house demolitions, you know the kind of thing). Our guide, Omar, was shocked. ‘But Palestine is beautiful’, he insisted. Living where he did he saw the land as the place of resistance – and also of everyday life, of culture, of ways of carrying on. All to be celebrated. Gaza is not as I expected. Amid the terror, there is hope. I have been reporting from Gaza all week, and, amid the stream of dead and injured civilians wheeled on trolleys before me, frantic people gesturing in my face, and nights spent in an unlit city under bombardment, I’ve come to a conclusion I did not expect: Gaza “works”. Gaza works because of Gaza’s people. Since Hamas took control in 2007, the place has been run by a group designated as terrorist, and under Islamic rule. Unable to rebuild after the Israeli invasion of 2008-9, they instead built tunnels – nobody knows how long – in which the military wing of Hamas, the Qassam Brigades, live, store their rockets and fight. The tunnels are also used to bring in the essential supplies that have been banned during the seven-year siege of Gaza. When this war is over, nothing good will happen in Gaza until the siege and blockade are lifted. Indeed, with 40% of the urban area unlivable because of the destruction, there will be a massive humanitarian crisis for months. Solving that crisis is not just a matter for NGOs. The way it is solved will dictate whether Gaza can survive. 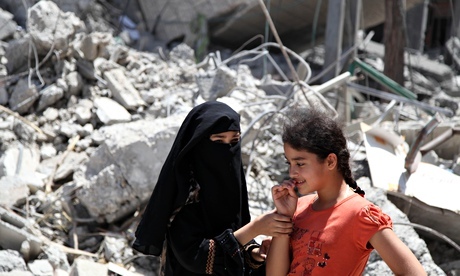 UNRWA, the UN agency for refugees that has opened its clean, blue-and-white schools to a dirty, chaotic surge of displaced humanity, says Gaza is “on a precipice”. The hospital I’ve just been in has 95 blast and bullet wounds to treat, with six intensive care beds. I have been to Muslim countries where there is deep conservatism, low education and suspicion of the west. This is not one of them. I constantly meet highly educated people who speak English; cheerful and friendly people – which is amazing in itself, given the level of terror the night brings. The world is not so blessed with educated, resourceful people that it can afford to waste the lives of 1.8 million Palestinians behind the iron grilles and the concrete walls that delimit Gaza. I have lost track of how many times I’ve met a young guy, 18 or 19 years old, proud not to be a fighter, a militant, or a duck-and-dive artist on the street. When you ask what his job is, the common answer is “carpenter”. Working with wood – not metal or computer code – is the limit of what the blockade has enabled the skilled manual worker here to achieve. Faced with such hopelessness, naturally, many become resigned: “Living is the same as being dead” is a phrase you hear among young men. It is the perfect rationale for the nihilist military organisation some choose to join. But its opposite is the resourcefulness that rewires a house after its front has been blown off; that sits on the carpet making bread on a hot pan after a home has been reduced to dust. There are only two economic routes for life to flow back into Gaza and, given the bitterness of this conflict, the route from Israel will not be the main one. Egypt holds the key to Gaza’s economic integration to the rest of the global economy. Open the Rafah crossing, and the need for the tunnels disappears. To the world this forlorn, impoverished and totally battered society has become a byword for impossibility and despair. But nobody has told Gazans. I found them full of hope. Secondly, a post from ‘Middle East Eye’, where ordinary Gazans were asked about their views on armed resistance, Hamas, Mahmoud Abbas and Egypt’s role as well as the future. Rather long, I’m afraid, but interesting for the variety of views – within a range which is clearly focused on resistance. GAZA – In an unusual moment of quiet, residents of the Gaza Strip were asked by MEE about their opinions of Israel’s latest war on the Gaza Strip and the Palestinian response. Here are some of their very thought-provoking responses. “Today there is a national consensus on the resistance as Israel continuously attacks. I refer to a group of Palestinian military factions who brought hope and spirit to occupied Palestinians, and Arabs alike. The Palestinian resistance has the ability to crack down on the Israeli occupation known ‘as the army never defeated,’ one of the most strategic and powerful military forces in the world. “Palestinians have hope that Palestinian political leadership headed by Abu Mazen [Mahmoud Abbas] will return to the same stage of combining Islamist and nationalist together, in order to lead the national project to end the Israeli occupation of Palestine, release prisoners and return Palestinian refugees. “I have a 7 year-old daughter; she has already lived through 3 wars with Israel, which killed around 5,000 Palestinians. When we talk about wars, we include the physical, psychological and emotional impact on Palestinian children from the first moment they are born. Many children in our world can’t imagine this. “As far as Egypt is concerned, we, as Palestinians, are looking for an Egyptian leader to take a role long-absent from the Arab scene, since the time of Mustafa Hafed – the Egyptian who was killed in Palestine by an Israeli explosive device, whose name is still honoured with a school named after him in Gaza. Abdelaziz was killed in Palestine at the hands of Israeli occupation forces. We remember Ahmed Abdelaziz who was killed when Egyptian officers and soldiers, were killed in Sinai at the hands of Israeli forces who took them as POWs, disarmed them, tied their hands behind their backs and executed all but one or two – making them dig the mass graves, before executing them too. Israel’s higher orders were to take no prisoners. Egyptians need to remember these things, and we, as Palestinians, need Egypt to work with us toward Arab reunification. The relationship between Egypt and Palestine is not simple. Our two nations have both human and historical relations. Egypt is considered to be, for all Arabs, the beating heart and pulse which combine the hopes and pains of all Arab nations. “When I talk about my daughter Areej, I have to mention the defeat in June 1967. I was born in that era, which was tough for Islamic and national movements. Since then, I have lived through several wars up to the present; 2014. “Hamas is a Palestinian resistance group which defends the Palestinian lands that Israel occupies. I disagree with it ideologically and some of its policies. The difference in ideology appeared at the period of contest for governance over Gaza, in military confrontations with Fatah and PA security forces lead by Abu Mazen. This made Hamas lose popularity, because it wanted to implement its principles and beliefs on the Palestinian people. However, as a legitimate resistance movement, I respect them, especially for resisting Israel as it continues its massacres against Palestinians for so many years. “As for Islamic Jihad – it’s a movement that has always avoided political squabbling -earning many peoples’ respect. It sidelined itself from political work and focused only on resisting Israel’s occupation. This makes them very respected among the Palestinian public, even though some Palestinians may view them as an extension of the Iranian regime in Palestine. But that is not a problem for me. “The foundation of Palestinian resistance is to defend Palestinian rights, and I respect that, as long as the gun is directed toward the Israeli occupation and its aim is to resist the occupation for Palestinian freedom. “I believe Egypt, as a neighboring country, will remain the defender of the Gaza Strip. Because the geographical and human relationship between us means Egypt is always present, even if they are absent from the scene because of a struggling political system. But there is no alternative to Egypt, it has to come back. “I believe Hamas is a movement which defends Palestinian rights – I see it as a potential defense army and I respect that highly. Islamic Jihad is also an extension of Hamas, “working for one objective – to liberate Palestine from occupation. I respect Islamic Jihad for not getting involved in Palestinian politics, but utilizing its efforts to fighting the Zionist project in Palestine. “I see Mahmoud Abbas as a legitimate Palestinian president and I respect him for carrying the cause of Palestine to the international arena. Now Abbas is standing for his people in Gaza, after he realized that Israel had little to offer him in real negotiations. “Hamas is a resistance movement working for the liberation of Palestine from the Jordan River to the Mediterranean Sea. It tries to resist occupation with all available means. We have seen Hamas develop over the years – any person who resists occupation, I respect very much. Hamas brings pride to us by capturing Israeli soldiers to exchange for our Palestinian prisoners. Israel is unwilling to release them. “Islamic Jihad is also a resistance movement with aims to liberate Palestine by adopting the Islamic project. I don’t know why they have reservations when it comes to joining a government, but I know in the previous war of 2012, Islamic Jihad played a role in the ceasefire, and now it has a vital part in mediating between Egypt and Hamas. “Regarding Abbas, he is the president of Palestine, but he is supposed to stand by all his people. He should stop security-coordination (PASF) with Israel. The power of Hamas resistance in Gaza is stronger because of their intention to fight collaborators. In the West Bank, security forces of President Abbas are not allowing people to resist illegal occupation. “Hamas: I think they are good. May Allah bless them for the work they do. They are the ones who will rescue us from Israel’s long-imposed siege. We have only Allah, then Hamas. I have always respected them for the work they do. They have helped through charity; helping many women and orphan children when the rest of the world turned their backs on them. “Islamic Jihad: may Allah protect them for defending us with their rockets, when we are attacked by Israel daily. They will rescue us and give us life. We live in the shadow of their resistance now. Before we were killed for no reason, and today we are killed, but at least we have resistance. The more Israel hits us, we have no one to turn to, except them. Borders are closed and our Arab brothers have forgotten us. “I am unhappy with Egypt, Sisi is supposed to be Muslim, but he is watching our children’s bodies torn to pieces by Israel’s weapons and our homes demolished over our heads. The Egyptian government is supporting Israel and not Palestinians. Didn’t Sisi see the small Gaza child whose brain poured out of her head? He should have acted more humane. Sisi can’t moderate a ceasefire and help the Israeli oppressor at the same time. “I never liked Hamas, because I disagree with their approach to ending conflict, but I am afraid we could not achieve our rights through other methods. Israel failed Abbas in negotiations and empowered Hamas by making people like me see them as the only option for changing a grim reality. The siege is killing people like me who need to feed 8 children. Now, Hamas sacrifices their lives and are owed our respect for trying the new approach – which is armed struggle – to end Israel’s siege and open the borders to freedom. Islamic Jihad has always been a good fighter in the field. I’ve never had problems with them. They are softer than Hamas, but their relationship with Egypt will open doors for Hamas in Egypt, after being shut by Sisi after Morsi was pushed out. Here, in lieu of a poem, is Rania Masri’s eloquent speech to a rally in Texas: ‘Mr Obama, what is barbaric?’ It deserves to be printed and learned by heart. Here (and I’m glad I haven’t used it before) is that apocalyptic anti-war song, Dylan’s ‘It’s a Hard Rain’s Gonna Fall’. It’ll do. Skipping the back of an envelope calculation as usual, I turned to https://www.biostars.org/p/5514/ or, ‘How Many Bytes is A Complete Human Genome?’ As you might expect, I was completely confused by the variety of answers. Apparently, when the four bases are packed into one byte (why not?) the zipped genome is 770 Mb, giving us 4.86871 E 10 Mb, or (help!) around 48.6 petabytes for the whole population. Where are all these petabytes going to be stored? No prizes if you guessed GCHQ. but they’re only 4 in 1000 births, which won’t save much. No, it’s obvious that once the dark forces have gathered our genomes onto their database, they will try to recoup the huge cost by selling it off to one and all. The banks would want to know who had the overdraft gene; Ryanair might pay for finding out who had an inherited intolerance of cramped airliners, so they could adjust their rates. As you might imagine, whatever the government may say, the security of your data is the last thing they’ll think about. [Added in proof. If the above reflections weren't enough, I invite you to consider - as the government blatantly has not - the fact that a so-called 'individual' or 'subject' in our population in in fact a complex ecosystem, a space in which (in whom?) multiple organisms coexist. [Another blow to Descartes?] See, for example, recent studies of the variety of bacteria – or even archaea – to be found in the navels even of those who had been washing themselves scrupulously. Some of whom (I mean the bacteria, not the so-called subjects) our researchers termed ‘oligarchs’, perhaps because of their frequency, although the implications of navel-inhabiting bacteria taking over Premier League football clubs are hard for this writer to take on board. Well, that’s enough on my usual obsessions. On to the Muses! I thought that Psalm 23 would be fairly uncontroversial, since the followers of most religions think it’s one of the better psalms – not self-pitying, aggressive, and so on. ב בִּנְאוֹת דֶּשֶׁא, יַרְבִּיצֵנִי; עַל-מֵי מְנֻחוֹת יְנַהֲלֵנִי. 2 He maketh me to lie down in green pastures; He leadeth me beside the still waters. ג נַפְשִׁי יְשׁוֹבֵב; יַנְחֵנִי בְמַעְגְּלֵי-צֶדֶק, לְמַעַן שְׁמוֹ. 3 He restoreth my soul; He guideth me in straight paths for His name’s sake. While many of us believe the ‘Super Mario Theme’ to be the most popular song ever written, figures are hard to come by. Even harder for today’s choice, ‘The East is Red‘, since it might be thought that the entire population of China owned a copy, at least in the sixties. Anyway, it’s an interesting subject on which to open an unfruitful discussion. Bye for now. You are currently viewing the archives for August, 2014 at Luke Hodgkin.